Beating Washington: Is the Impact Primarily Symbolic or Substantive? A sweet hole for CJ Verdell. My friends, there are so many areas of that game to analyze, and I will let Coach Ken Woody do so on Wednesday, and Coach Boles in his upcoming analysis of the GT Counter play. I will also do analysis work in the long off-season, but the aforementioned topic is nagging at me, and I wish to lay it all out and get your feedback. As you know, this site is where people come to ponder share with other wise Greybeards their thoughts about everything that is Duck, protected from the hatefulness of the trolls. In the aftermath of the euphoria that has swept over us all, let’s consider the impact of this game, and whether it is tangible now or whether the impact will be felt in the years to follow. A Victory of Substantive Impact for Oregon … Now? A first year coach caught up to the Huskies. 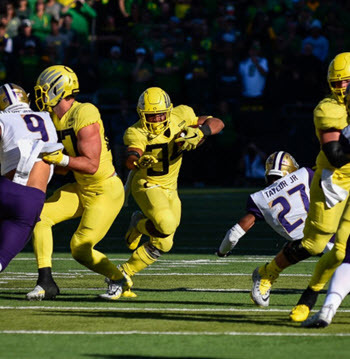 Oregon played Washington as tough in the trenches as the Huskies did on both sides of the ball. Oregon has successfully moved from Kelly/Helfrich Spread Offense to a Pro-Style NFL offense quickly. The Ducks are playing much more disciplined defense, and are stouter in the front seven than before. Recruiting was significantly and positively impacted by Saturday’s game and we will see the effects soon. Proof of the defense’s progress was evident with the front seven’s superb gap control. Oregon is ahead of schedule in the rebuild from the Helfrich disaster. 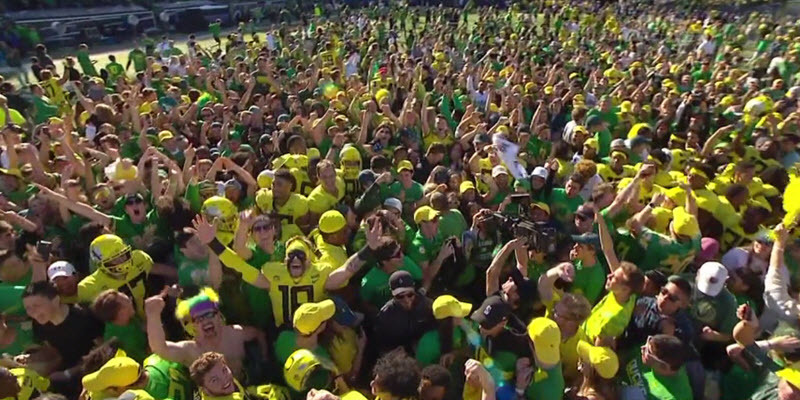 Oregon has placed themselves to run the table and possibly go all the way to a National Playoff berth. Players mob Verdell after beating UW. Now, not all these are ideas I personally support, but they are important to other Greybeards, and I invite you to add to the list or elaborate on one or more of them. The most compelling argument for this victory being substantive is that, with more losses by other top teams, Oregon could slip into the National Playoff if they run the table and beat the Pac-12 representative from the Southern Division. I do not deny that, as we have a Heisman-quality home grown quarterback for the “background story-line” that the media loves, as well as the new, interesting narrative of how the Ducks have morphed into a team that is tough in the trenches. Add to that the Oregon national brand built from 2010-2014, and you have the makings of “Oregon is back” and the wins reinforce that belief, which can help the Ducks’ cause. To me, all of this is true if the Ducks win out, but what if they drop two or three more games? Playing in the Palouse and now in Salt Lake City is going to be tough, especially with how close in talent the Pac-12 teams are at the moment. Can you add to this substantive impact argument? The hoax of Chris Petersen being Oregon’s kryptonite has been exposed, as Oregon has proven they have closed the gap between the two programs rapidly. The new narrative that Oregon has become tough in the trenches now has legs, with proof from the games against Stanford and Washington. This was a major question coming into the 2018 season. 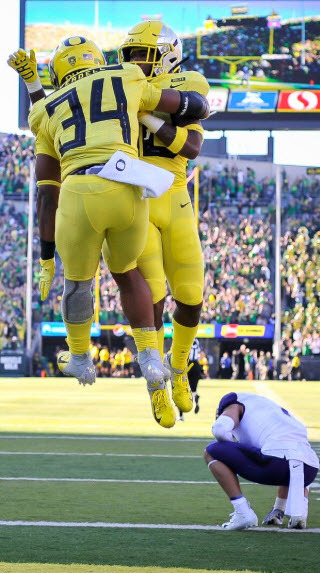 To achieve elite status … Oregon has to play in, become hardened from and win the big games. The Cardinal loss was invaluable as a teaching tool to a truly green team and staff. The foundation of the future is being laid with this victory over the Huskies, regardless of win-loss results of this season. Oregon is not ready for top four stature, as the depth is yet to be developed from future recruiting classes. Oregon also has a ways to go in player development. Enormous progress has been made in a short time, but we will look back three years from now and smile at what we are talking about presently, and about what we will then know about building an elite team. The Ducks are on that path, but nowhere near the level at which we can take on the bench of talent that the Buckeyes, the Clemson Tigers or the ‘Tide have. Coach Mario Cristobal’s backing of players who have made errors, and his efforts to overcome that adversity is championship-grade culture building, but it needs to be tempered under more fire (more games). Cristobal’s never-back-down approach is another winning component of his culture, and, while that and the previous point are winning over the players, more experience is needed by the team to ingrain these elements into the DNA of this team. The only way this proves to be a substantive victory is if Oregon wins big the rest of the season. 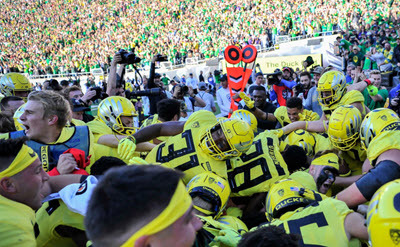 Yet, this victory has important symbolic impact regardless of the season’s results, as it shows everyone the path that this Duck football team is on. Substantive or symbolic? Which is the primary impact to you and why?